Quartz crystal was, before the war, a minor nonmetallic resource. Wartime demand for large-sized clear single crystals of quartz for use in making quartz oscillator plates for radio frequency control has emphasized the strategic importance of this industrial mineral. Quartz crystal of usable quality is of limited occurrence, and little has been written regarding the geology of the deposits although there has been considerable work done during the war period. There are also interesting relationships to be brought out between the mineralogical and geological characteristics of quartz and the problems inherent in the supply and use of this commodity. It is the purpose of this paper to discuss the geology and mineralogy of quartz crystal deposits and to point out the interdependence of quartz crystal geology and the supply situation in Brazil. The information contained in this article has been gathered during more than three years' work by each of the authors in the government service on problems involving quartz crystals. Geological description is in part the result of the authors' work but is chiefly compiled from unpublished work of others. Most important is the work of the geologists and mining engineers employed in Brazil by the Foreign Economic Administration, to whom acknowledgment is particularly made. Unpublished information of the U. S. Geological Survey on domestic deposits has not been included, but publication by that agency is expected in due course. Much of the geological information on quartz deposits throughout the world remains to be correlated. Some is still restricted. The interim observations in this paper may, however, serve as an introduction to an understanding of the geology of this commodity and the relationship of the geology to the problem of supply. The minimum size and quality requirements for quartz crystal to be economically usable are somewhat indefinite and depend upon the manufacturing method to be used, changing economic factors such as price, and to some degree upon the preference of the user. Individual crystals are required to be approximately 100 grams (about 4 oz.) to 2000 grams (about 42 lbs.) in weight; shape is a factor in material less than 200 grams in weight. Crystals both larger and smaller find some use in the oscillator plate industry. The former are difficult to saw and are high priced; the latter require more labor in their use and will usually not allow fabrication of the Â¾" square or 1" square plates. Industry has accommodated itself to the use of unfaced crystals above 200 grams in weight. The quality of the stone is also a fundamental factor. Many types of defects are considered in classifying radio grade crystal. The clarity of the stone determines whether it meets the minimum acceptable quality levels. Generally 50 per cent of each stone must be free from any visible defects when the stone is suitably illuminated. Usable crystals are further subdivided on the basis of additional tests. If less than one-half the volume is eyeclean, use of the stone is generally uneconomic. National Bureau of Standards specifications are slightly higher. These requirements both as to size and quality, as stated, are considerably different from the acceptance standards in use before the war. In general, stones less than 2 lbs. in weight did not find ready acceptance and the presence of several natural faces was usually required; various minor imperfections now allowable were considered to render crystals unusable. Of the companies manufacturing oscillator plates, only one of the twenty-eight which reported in February 1942 indicated that the quartz crystals they used averaged less than 1 lb. in weight. This company used crystals averaging Â¾ of a pound. Nineteen of the twenty-eight companies reported that 1 lb. was the minimum size. In the earlier days of the war the trend toward the use of smaller-sized stones began and by early 1943 their use was general throughout the industry. It is estimated that in February 1942, 25% of the consumption was of crystals from 200 to 500 grams in weight, and 75% of the consumption was of crystals 500 grams and heavier. In 1944, 30% of the consumption was estimated to be less than 200 grams, 50% to be 200 to 500 grams and only 20% to be 500 grams and higher. There was considerable emphasis on minor defects during 1942 due to desire of the manufacturers not to jeopardize badly needed production by using raw material of questionable quality. 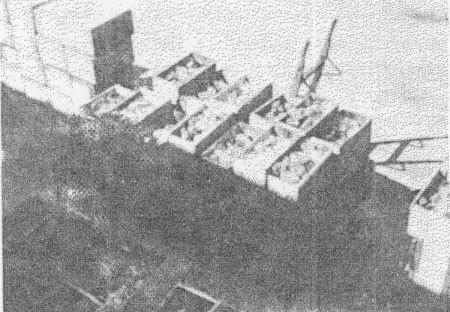 However, in 1943, with the advent of more efficient manufacturing techniques, larger plant capacity and increased demand for raw material, the defects were widely accepted and successfully utilized. Quality standards were relaxed somewhat to the present minimum standards which have been described. The development of the use of smaller sizes and lower quality crystals was of great importance in connection with supply in that it rendered usable large quantities of hitherto rejected material. The supply of quartz crystal which is used in the U. S. comes almost entirely from Brazil. Deposits are known and worked in USSR1 and small deposits have been investigated elsewhere. Some quartz has been used by the U. S. industry which has been mined in the states of Arkansas, Virginia, North Carolina and California, and a small amount of material has been imported from Guatemala, Colombia and USSR. Since the production has been very small from sources other than Brazil, it has had no appreciable effect on the overall United States supply situation. U. S. imports of Brazilian quartz for consumption in 1939 were 67,052 lbs. ; in 1940, 126,521 lbs.2 Imports since 1940 are measured in hundreds of tons rather than in thousands of pounds. The problem of insuring availability of quartz crystal for necessary war production has received the cooperation of private industry and government throughout the war period both in U. S. and Brazil. Buying of quartz was instituted in Brazil by the U. S. Government in 1941, and production has been reserved to the United Nations. U. S. Government purchases in Brazil have been under the successive auspices of Metals Reserve Company and the U. S. Commercial Company, a subsidiary of Foreign Economic Administration. Government-purchased quartz has been sent to the National Bureau of Standards, graded and placed in the national stockpile in custody of the Metals Reserve Company. Quartz is released by the War Production Board from the stockpile to consumers when justified and is used for the manufacture of quartz crystal units and other strategic items for the armed services. Private importers who were actively engaged in importation of quartz before April 1942 have continued in business under WPB regulations and have provided a large part of the quartz imports used for these strategic items during the war period. This quartz is supplied direct to consumers. The grading practice employed by the importers varies somewhat from that of the Bureau of Standards, but the variation in the standards of quality required by industry due to differences in processing methods have served to allow quartz graded by both NBS and the private importers to find an appropriate market. The geology of quartz deposits in various parts of the world is only beginning to become known. Such material as is available has in most cases not yet been correlated due to pressure of war work. In the discussion which follows, the description of deposits and general observations on the geology and mineralogy are made with the realization that studies will become available which will provide more detailed information. Productive quartz deposits in Australia are located in northern New South Wales at the Kingsgate mining camp, twenty miles from Glen Innis. Crystals of various sizes have been produced and used by Australian oscillator plate manufacturers but the production has not met Australian requirements. The mines in this camp were worked for molybdenite and bismuth in the last war. During the present war, some of the mines have been reopened for quartz crystals. 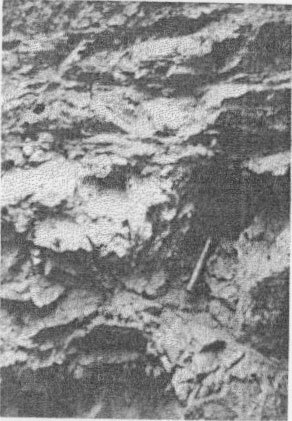 The mineralized area in which quartz occurs has been worked over a zone 1 3/4 miles long and 2 mile wide, which is within a granite near the contact with slate.3 Here there are scores of pipes three to sixty feet in diameter. These pipes plunge in all directions and some of them have been shown to extend to depths of 500 feet. Some pipes are bordered by slate along part of their extension in depth but none is entirely within the slate. Molybdenite, wolframite and native bismuth as well as carbonate and oxides of bismuth are present and gold and silver are associated with the bismuth. Within the pipes or in branches or bulges which are tributary to them, are open cavities lined with quartz. In some cases the crystals occur on the hanging wall side. Less than 1 lb. of usable quartz per ton of rock mined was reported from various operations over a period of several months. The occurrence stands out as the only described example of usable crystals in a deposit economically productive of metallic minerals. Guatemala quartz deposits are located4 in the Department of Baja Verapaz, north of Guatemala City and occur in an area of gneisses and schists. The occurrences are characteristically small gash veins in the schists. The veins contain fine-grained quartz at the border and well-formed crystals in the clay material which occupies the central part of the veins. The crystals in the few tons of radio grade quartz produced have been largely 200-500 grams in weight. A productive quartz deposit has been developed in Colombia near the town of Muzo, Boyaca, Colombia.5 It consists of one principal vein and numerous subordinate veins. These veins are localized by fractures in a drag fold structure on the vertical limb of a tight anticline in the Cretaceous slates (Villeta formation). Milky fractured comb quartz fills the main vein which averages about 32 feet thick and dips 30 degrees. Iron oxide and calcite are the only associated minerals reported. Significant amounts of usable crystals persisted to only a few meters in depth. The quartz crystal is well terminated at one end and the clear crystals line irregular cavities. The cloudy base of the crystals necessitated extensive trimming. A few tons of merchantable crystals largely 200 grams to 500 grams in weight have been produced, although a few crystals weighed up to 13 kilograms. 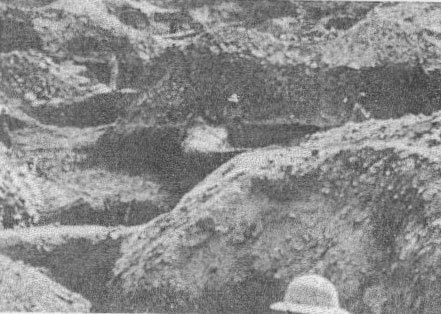 The search for radio quality quartz in the U. S. during the war period has been stimulated by the War Production Board, Metals Reserve Company, the U. S. Geological Survey and numerous private concerns. As a result of these efforts a good deal more than formerly is known of the occurrence of radio grade quartz in the U. S. Information regarding the localities in the U. S. has been gathered and is being correlated by the U. S. Geological Survey. The remarks included in this paper serve to mention only a few points of interest regarding quartz in this country. The greatest number of usable crystals has come from Arkansas, California, western North Carolina and southwestern Virginia. The Arkansas deposits have recently been described and preliminary information about other deposits in U. S. has been released.6 Crystals of good quality have been purchased in Arkansas but no mines have been worked much beyond the development stage, largely because of the cost involved. In several of the prospects which were worked, crystals were mostly in the smaller weight class; in one other the crystals were characterized by excessive electrical twinning. Crystals have been produced in southwestern Virginia and western North Carolina largely as a result of activity stimulated by the United States Government. With one or two exceptions the crystal has not been found in place in veins but has been found in the weathered mantle on the farms of the region. The crystals are in general larger than 200 grams. In the same localities where the crystals have been found, veins of massive quartz outcrop. So far as is known these veins have not been explored except by one or two prospect pits. The genetic connection between the outcropping veins and the crystals in the soil has not been established. Most of the quartz produced in California has come from buried placers in the Sierras. Individual crystals are of very large size but available information does not suggest that any large amount of crystal is to be expected from this source. In general, the widespread search and examination of reported occurrences of radio grade quartz in the U. S. has indicated areas of some promise as has been mentioned above. In California and in Arkansas where the greatest amount of exploration has been carried on, the results suggest that there is no large tonnage available. From the results obtained, it appears that production from domestic sources could not be great enough to contribute significantly to the requirements such as were demanded by this war. The principal quartz deposits of Brazil are situated in the states of Minas Gerais, Goiaz and Baia. So far as is known none of the other states yield significant quantities except Espirito Santo and Para. Quartz of good quality is occasionally reported from Paraiba, Matto Grosso, Maranhao, Amazonas, Pernambuco and Ceara. Almost no quartz crystal occurs south of the latitude of Rio de Janeiro. The relative production of the various Brazilian states has been estimated as follows: Minas Gerais 35%, Goiaz 30%, Baia 20%, Espirito Santo 5%, all others 10%. Approximately half the production from Goiaz is mined near Pium in the hills west of the Rio Tocantins in the north central part of the state (Fig. 1). The nearest center is Porto Nacional. At least one-quarter and perhaps one-third of the production of the state originates in southeastern Goiaz near the town Cristalina. Anapolis, and Ipameri, approximately 125 kilometers further south, are the principal shipping points for all Goiaz crystal. Other producing areas are present in east central Goiaz and in the northern and western parts of the state. The most important producing district in Baia is located in the north central part of the state, east and south of the Rio Sao Francisco, southwest of Joazeiro on the river, and has been designated as the Mimoso-Alegre-Batateiras district (Fig. 1). The other producing region of importance lies in the central part of the state and is virtually continuous with the north central area. Various centers of production have been reported from the southern and southeastern parts of the state, for example Conquista, from which excellent quartz has been obtained. In general the districts in Baia are situated east of the Rio Sao Francisco. Information is extremely scanty regarding the area between the producing areas in Baia and those to the south in Minas Gerais. This region is most inaccessible and may contain important deposits of crystal not yet developed. Numerous small deposits occur in the central part of the state near Vitoria and south of the Rio Doce. The regions in Brazil which produce quartz lie in four belts or zones which trend north to northeast in direction as shown in Fig. 1. These belts are: (1) Northern Goiaz - extending for at least 600 kilometers in the northwestern part of the state, west of the Rio Tocantins; (2) Southern Goiaz - extending from the vicinity of Cristalina, Goiaz, northwards along the Goiaz-Minas and Goiaz-Baia border for 500 kilometers with ultimate northern extremity not known; (3) Minas-Baia - extending some 1200 kilometers from Pitangui and Sete LagÃ´as in Minas Gerais to the vicinity of Sento Se and Joazeiro on the Rio Sao Francisco in Baia; and (4) Coastal - a belt some 300 kilometers in length, including the deposits in Espirito Santo, and those near Aimores, Minas Gerais, at the northern end of the belt. The northern Goiaz zone continues into the adjacent state of Para. Deposits of the first three classes mentioned are gradational one to the other. The striking feature of all the deposits is the extremely small proportion of usable crystal in relation to the total quartz. Enormous quantities of milky bull quartz are mined to produce a few kilograms of usable clear crystal. The production comes from hundreds of mines or diggings, very few of which involve underground mining. 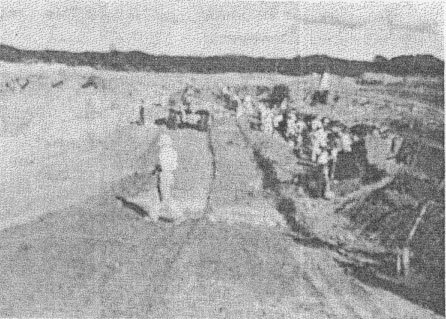 It is estimated that during the war period there have been no more than six to twelve mines in Brazil in which there has been production of one ton a month for any length of time. Most diggings produce less than 500 pounds per month and many only 50 or less. Veins and composite lodes yielding commercial quartz are a particularly important type of deposit in the southern part of the Minas-Baia belt. Wall rocks are commonly shale or shale and granite. In other parts of Brazil veins occur in quartzite or sandstone although in these rocks the yield from accompanying bedded replacements, pipes or pockets is the more important. In the shale near Sete LagÃ´as in Minas Gerais lodes are fairly persistent along their strike, although in most instances individual shoots or lenses within the veins are not so persistent. The quartz commonly forms conformable bedded deposits in the walls of the vein proper. Because of the varying nature of the crystal occurrences in the walls as well as the variation in width of the lode or vein system, mining widths may show a wide range in any one deposit. Veins, lodes and their accompanying bedded deposits contain milky bull quartz, clay, manganese and iron oxides, and remnants of country rock. Clear crystal occurs in groups or individuals embedded in the bull quartz or in places in vugs usually nearly filled with material. The clear quartz appears to have formed at a later stage than the bull quartz. Manganese oxide is more abundant in the vicinity of crystal and usually can be considered as an indicator. This association does not assume genetic significance as the time of formation of the crystal and the oxide could have differed greatly. The best example of a lode in shale is furnished by the Guachi mine near Sete LagÃ´as (Fig. 2). The vein system has an approximate north-south strike and moderate westerly dip averaging about 60 degrees. Mining has occurred along a strike length of 400 meters and to a depth of some 25 meters below the original surface. The wall rock is weathered shale, yellow in color, lying immediately below a red clay capping which contained some crystal. The system is composed of a series of lenses which pinch out both vertically and horizontally. Greatest mining width reached was a few meters, but horses of country rock occupied much of the cross section. The distribution of values was erratic. The workings at the Guachi mine have now been abandoned because with depth the yield of crystals became uneconomic. An excellent example of a vein system occurring along a shale-granite contact is afforded by the Onca Mine, also in the Sete LagÃ´as District. This has been one of the most productive mines with a steady production of one to two tons of mine clean quartz per month. Fig. 3 illustrates the main vein workings, and Fig. 4 represents a geologic cross section of the deposit. The strike length exposed on the mine workings is 500 meters. The workings reach a depth of 30 meters beneath the original surface. The vein strikes approximately north-south and dips to the west at moderate angles ranging from 45 degrees to 65 degrees. The rock on the east (footwall) side of the vein is weathered granite, on the west (hanging wall) side is weathered shale. The lode is composed of a system of quartz stringers, veins, and lenses occupying a position in the shale adjacent to the granite. Horses of shale are common. Along the contact and decreasing away from it into the hanging wall, the shale is somewhat folded and distorted with extremely variable dips. It appears in general to have moderate dips, slightly flatter than the contact dip near the contact, and to become flatter to the west. Quartz also occurs along the bedding planes in the crumpled shales of the hanging wall (Fig. 5). FIG. 2. Looking south along the strike of the vein system at the Guachi mine, near Sete LagÃ´as, Minas Gerais. Mining of nearly vertical vein by hand methods in foreground. Red overburden has been stripped off and mining will advance to center of picture. Old workings are in background pit on same vein zone although individual veins pinch out along the strike. FIG. 3. Looking south along strike of the vein zone, Onca Mine, Sete LagÃ´as, Minas Gerais. Weathered shale to the right is the hanging wall. Footwall of granite is in shadow to the left. Due to the structure of the lode and the varying quantity of hanging wall quartz, mining widths vary greatly, ranging up to 20 meters in places. It is held that the granite has intruded the shale, or the shale has been faulted against the granite, or the shale was deposited adjacent to an eroded granite ridge. H. K. Shearer who has done the most work in the region advocates the depositional contact. 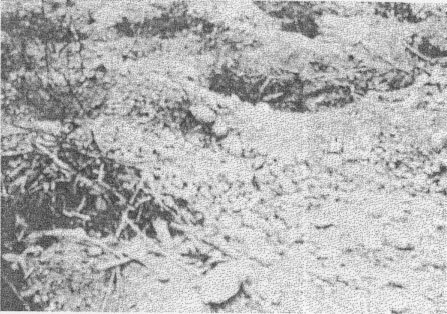 The important deposits near Pium, Goiaz, as described by H. K. Shearer9 are best classed as veins. Wall rocks are schists of sedimentary derivation and intercalated quartzite. Weathering has rendered the formations soft. The quartz occurs in irregular veins and lenses, transecting the schist and quartzite. Individual crystals of bull quartz attained enormous sizes. Shearer mentions one 2.5 meters in length and 1.5 meters in diameter. Clear crystal of commercial value represents only a fraction of the material which is mined. FIG. 4. Cross section of Onca Mine. After H. K. Shearer. FIG. 5. Official U. S. Navy Photograph. Veins in folded shale of the footwall, Onca Mine, Sete LagÃ´as, Minas Gerais. Veins contain quartz and manganese oxide. Similar veins, somewhat larger than most of those in the picture are the source of much good crystal. Perhaps the best example of a pipe-like deposit is afforded by the Alegre mine some 20 kilometers south of Mimoso, Baia. The country rock is compact, fine-grained quartzite. According to F. D. Hanson11 the pipelike mass of quartz is localized at the intersection of two fairly prominent groups of closely spaced joints or fissures of small displacement. The bulk of the material in the pipe is coarse milky bull quartz containing some comb quartz and well-formed crystals. The pipe is approximately 10 meters by 15 meters in horizontal dimensions and has been mined to a depth of 15 meters. The walls are extremely irregular and pockets, tongues and masses of quartz protrude from the margins into the surrounding rock. Clear crystals occur in irregularly shaped pockets within the bull quartz throughout the volume which has been opened. There is no clue to the structural distribution of the valuable material. Pockets are filled in varying degrees with clear crystal which is well terminated. Replacement of the country rock was the dominant process although the silica may have been provided from the surrounding quartzite. An interesting and common feature of the crystal from the Alegre Mine is the presence of phantoms of manganese oxides in many of the otherwise clear crystals. Except for this defect, the crystal is reported to be of good quality. Blanket replacement deposits are well developed at Mimoso and elsewhere in Baia, at many places in Minas Gerais, and in Goiaz. It is common for this type of deposit to be associated with veins in shale sandstone, or quartzite, and with pipes, pods, and associated forms in sandstones and quartzites. The deposit at Mimoso is not associated with accessory types and furnishes a spectacular example of blanket deposit from which there has been important production. FIG. 6. Pits in shale, some of which extend down to lower bull quartz horizon, Mimoso, Baia. Walls of broken rock between pits are shored up with boulders of bull quartz which have been mined in search for crystal. Stripping has exposed upper quartz horizon in left center of the photograph. Man in center stands on top of upper quartz horizon. Mimoso lies about 200 kilometers west of Bomfim, Baia, in the midst of a dissected plateau with sandstone and quartzite exposed at the surface. Shale underlying the sandstone is exposed in the valleys. A broad flat anticlinal dome with its axis trending east-west shows an indefinite terrace on its southern flank. Dips range from 4 degrees to 7 degrees and the terrace is essentially horizontal. Three beds of replacement quartz occupy closely spaced positions in the shale country rock (Figs. 6, 7 and 8). The horizontal continuity of these beds has not been entirely established. The middle bed is relatively insignificant, thin, and restricted in its occurrence and will not be discussed further. All the beds contain residual masses of shale. Here and there erosion has exposed the beds but for the most part they are covered by partly weathered shale. The upper bed probably underlies an area of about 2.5 square kilometers on the south flank of the dome. It ranges in thickness from less than one to two meters. The lower bed underlies a known area of about 2 square kilometers more or less coextensive with the terrace but extending beyond its limits, particularly to the west and to the south down the dip. It ranges in thickness from about 1 to 4 meters. The average separation between the two beds is about 8 meters. Each bed has produced large quantities of crystal. FIG. 7. Blanket deposit. Mimoso, Baia. Coarse-grained bull quartz and pockets from which commercial crystal has been removed. FIG. 8. Cross section of the important blanket deposit, Mimoso, Baia. After J. C. Schell. Looking northeast. Horizontal distance represented is 350 meters. Vertical scale exaggerated. The best production from the upper bed was realized from the central part of the area along a belt parallel to the structural terrace and overlapping its extent towards the crest of the dome. Many parts of the lower bed have been prospected up to this time but the best production has been obtained from a small zone of about 10,000 square meters area, lying in the structural terrace. Small abrupt folds striking northeast-southwest occur in the vicinity of the best crystal (Fig. 9), and tiny quartz-filled joints are present in the shale beds. Prospecting along the trends of folds or groups of joints has been fairly successful. In the outlying part of the district active prospecting along these features has, however, not yet disclosed commercial crystal. Manganese and iron oxides and clay are the only visible minerals accompanying the quartz. The lower bed, for example, consists of massive bull quartz of varying crystallinity, some of the crystals being fairly well-formed. At planes thought to be localized or at least related to the structural features in the shales, manganese staining becomes more prominent and continued work at times leads to a pocket of crystal. The pockets range from a few centimeters in size to several meters and are filled to varying degrees with well-formed crystal not all of which, however, is a commercial product. The commercial crystal characteristically contains "blue needles." Pockets may be within the massive bull quartz or make out into the roof or bottom. There does not appear to be a favored vertical position within the quartz bed for the development of crystal. Enormous quantities of material have been mined at Mimoso. Much of the work, however, has been in an attempt to reach the crystal zone itself so that the ratio of earth moved to crystal produced has depended upon the depth of the bed. 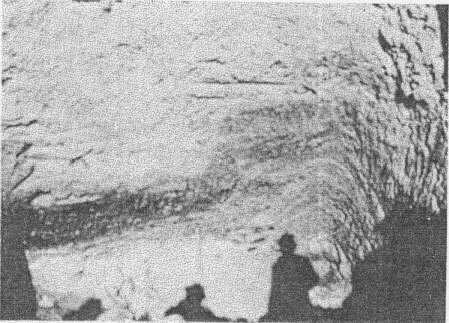 At the Rosilho mine, southeast of Mimoso, a steeply dipping vein flattens near the surface to form a blanket of small extent in the country rock which is sandstone. Adjacent to the bull quartz blanket the sandstone is noticeably silicified. This occurrence provides a clear example of wall rock alteration adjacent to a quartz deposit. In general, however, observation of the effects of wall rock alteration is difficult due to the extensive weathering. FIG. 9. Small fold in shale. Mimoso, Baia. These folds appear to be related to concentration of crystal in the bull quartz exposed in the bottom of the pit. True pegmatites have not contributed appreciably to the quartz production of Brazil. It is suspected that the pegmatite belt of eastern Minas Gerais may contain some crystal, but production from true pegmatites appears to be insignificant. Deposits from Teofilo Ottoni, Minas Gerais, are reported to be of pegmatite type. It is possible that the crystal from the swamp-covered alluvial deposits of Espirito Santo is of pegmatitic derivation as suggested by Knouse.12 Veins or masses with feldspar could be classed as pegmatitic or possibly as deposits allied to the pegmatites. Two representatives of this type are known: one near Conquista, Baia, the other near Oliveira dos Brejinhos, Baia. The crystal from Conquista is of excellent quality and although material from Oliveira dos Brejinhos is supposed to be good, no first hand data are available. Oliveira dos Brejinhos lies about 60 kilometers southeast of Jardinopolis which is on the Rio Sao Francisco. The quartz mine is a few kilometers west of the town. According to F. L. Knouse,13 a formation composed mainly of fine-grained quartzite strikes north-south and dips 60 degrees west. from a ridge west of Oliveira dos Brejinhos. Two sill-like masses of quartz and kaolinized feldspar constitute the deposit. One is about 4 meters thick, the other about 2, and they are separated by about 7 meters of country rock quartzite. About 80% of the bodies consists of a quartz core; kaolinized feldspar with tourmaline needles lies along both the foot and hanging walls. Commercial crystal occurs throughout the quartz but particularly so in the kaolinized footwall. 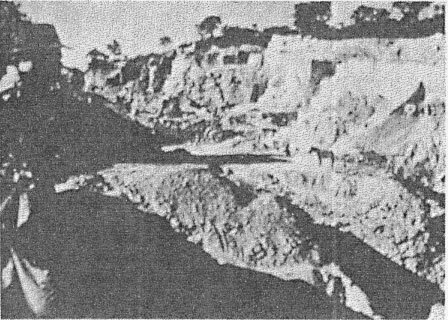 The deposit near Conquista, Baia was examined by D. de C. Smythe.14 Vertical veins a few centimeters in thickness cut sandstone and gneiss exposed along the slopes of a low hill. The veins have a central zone of quartz and margins of red feldspar. Crystals are large and some of them contain usable portions. Eluvial deposits of quartz occur throughout the crystal-producing region of Brazil. They grade on the one hand into alluvial deposits and on the other into primary material in place. The surface zone at Pium may be considered as eluvial, and there are numerous examples in Minas Gerais (Fig. 10). Crystal is mined from many places where eluvial and alluvial processes and primary deposition are all important and it is difficult to diagnose the actual relations. Float at the surface has been the common indicator of underlying deposits (Fig. 11). Quartz from eluvial deposits may show a considerable degree of rounding. It is probable that while some of these deposits may be the eroded roots of primary deposits, others may overlie primary deposits and represent erosion of a considerable thickness of overlying material concentrated by gravity without lateral movement. Undoubtedly alluvial deposits occur throughout the crystal-producing region, but so far as is known are best represented in central Minas Gerais and Espirito Santo. Present streams occasionally yield commercial stones as a by-product of diamond placering. In general alluvial deposits lie buried beneath clay, particularly red clay, or beneath swampy ground as in Espirito Santo.15 They are characterized by small-to-medium-sized stones, the commercial ones being of good quality though usually somewhat rounded (Rollados), contained in a relatively thin bed of clay. In places several beds occur separated by a meter or so of noncrystal-bearing clay, sand or gravel. FIG. 10. Eluvial deposit, northwest of Sete LagÃ´as, Minas Gerais. Crystals are picked from the dirt which is broken down by picks and shovels. A carry-all removes the material to the dump. FIG. 11. Prospect pits in residual weathered rock representative of the hundreds of such pits near Sete LagÃ´as, Minas Gerais. The bedrock in this region is red shale. Rock fragments are bull quartz. The Gameleira mine furnishes an excellent example of an alluvial deposit. It lies about 70 kilometers north of Curvelo, Minas Gerais. A bed of crystal-bearing yellow clay with maximum thickness of one meter underlies a varying quantity of red clay along the flanks of a very gently sloping hill. The thickness of the red clay overburden ranges from two to six meters. The mineralogy of the crystal deposits in bedrock is extremely simple. Quartz crystals are not produced in quantity from the same veins which produce other minerals. A black manganese oxide mineral frequently occurs in the crystal-bearing sections of the quartz veins and chlorite and limonitic stain are common. Several other minerals are reported, such as tourmaline, anatase, rutile, pyrite, an amphibole and clay minerals. A crystal supposed to have come from one of the mines in quartzite in Baia contains a small fairly perfect diamond included in the cap. Inclusions of pyrite are very rare. Quartz said to have originated near Xique-Xique, Baia, is yellow in color and contains fluid inclusions, hydrogen sulphide being given off when scratched. Shearer16 reports a minute quantity of associated pyrite and arsenopyrite from deposits near Pium, Goiaz. Chlorite is commonly included in the crystals from the Pedra Verde mine in the Mimoso district of northern Baia. More thorough mineralogical study will undoubtedly add to the list of associated minerals. These associated minerals are, however, rare except for the oxides of manganese and iron, clay minerals and chlorite, so rare that specimens of them from crystal mines are unusual. The crystals occur in vugs or pockets in the milky vein quartz. The ratio of milky or cloudy bull quartz to clear crystal varies but has been estimated as lying between 10,000 to 1 and 1000 to 1. Quartz crystals occur in the veins in all sizes from the most minute to those famous crystals which weigh over five tons each. Some idea of the size distribution may be had from the following figures calculated from records of the weight classification of material purchased by the U. S. Government over a part of the war period. The statistics show the greater rarity of the heavier (larger) crystals but also indicate that a surprising percentage fall in the 300-700 gram (approximately Â½ lb.-1Â½ lbs.) category. It should be pointed out that there are certain limitations on the data since the figures were not compiled for the purpose to which they are being put in this paper although they nevertheless serve as a basis for a quantitative estimate. The figures represent size distribution of crystals in the 200-10,000 gram weight class which have been prepared for market and sold to the U. S. Government. Actually one end of many of the crystals may have been trimmed to remove cloudy areas; therefore, the figures indicate smaller-sized crystals than would actually be the case if the data related to newly mined untrimmed material. To an important degree material under 200 grams also finds a market and is very plentiful. It may be estimated that there are at least twice as many crystals of 100-200 gram weight class as all the larger sizes. * Data based on over l2 million crystals. It is noteworthy that little of the clear quartz on the market is without a recognizable crystal face. Many of those unfaced crystals sold are fragments of larger crystals which did occur with natural faces present. From figures available it appears that the percentage of material in the 200 gram to 10,000 gram weight range which contains no recognizable face is from 5 to 20% of the total. Examination of the mines also points to the same conclusion. Anhedral quartz in the veins is almost entirely milky; translucent patches are rare or absent. While this might be expected, this contrasts with the condition of the massive quartz in some of the North Carolina-Virginia quartz veins in which translucent but not clear areas of vein quartz are sometimes seen. The interdependence of the mineralogical and geological factors, commercial practice and the problem of supply is well illustrated by the war time crystal program; mineralogical differences in quartz crystals are reflected in crystal classification and affect commercial practice. Crystals are classified by weight in the Brazilian market. Twelve weight groups are recognized: less-than-200 grams, 200-300 grams, 300-500 grams, 500-700 grams, 700-1000 grams, 1-2 kg., 2-3 kg., 3-4 kg., 4-5 kg., 5-7 kg., 7-10 kg., and 10 kg. up. Crystal is further subdivided according to quality grades A, B, C, and D. Both the quality and weight classes have acquired legal status due to the incorporation of these in the Brazilian tabela, a table of prices used in levying export taxes. The procedures followed in the manufacture of oscillator plates are adapted to the shape and size of the crystals utilized, but it is generally not practical to use shape as a basis for classification. The National Bureau of Standards has used the shape of quartz crystals in classification of the material in the less-than-200 gram weight group. A minimum length parallel to the c-axis and a minimum diameter perpendicular to the c-axis is required. Shape is not considered in classifying the stones in the heavier weight groups. The shape of the commercial crystal is affected by the practice of trimming stones to remove the poor quality material. It is particularly common for quartz crystals to contain veils toward the base of the crystal and these are removed by expert trimmers who take advantage of the fact that crystals break easily along planes roughly parallel to rhombohedral faces. Several features of the geology of the crystal deposits in Brazil which have been described have an important bearing on quartz crystal supply. The deposits are individually very small producers and are distributed over a large area, localized in four belts which do not coincide with the most populated regions of the country. As has been pointed out most of the mines produce less than 500 pounds of radio quality crystal per month and many only 50 or less, so that the total Brazilian production comes from several hundred deposits. The sedimentary rocks in which the deposits occur are frequently deeply weathered, allowing open pit mining without the use of explosives or machinery. Thus great numbers of individuals are engaged in independent mining in their own diggings. These people lead a nomadic existence, moving from one area to another because most small deposits are soon worked out and more favorable ground is opened elsewhere. In most areas transportation is difficult and so a condition of local trading has sprung up where the miner sells the crystal to a local merchant rather than direct to the quartz exporter. The merchant accumulates crystal and then disposes of it to another buyer. The crystal usually passes through many hands before reaching the exporter. This results in an appreciable time lag between production and the arrival of the quartz in the ports of Rio and Sao Salvador from which it is exported (Fig. 12). The various size and quality classifications used by the exporter further complicate the supply situation, particularly since so many producers are involved. The grade of the material and the judgment of quality are the considerations which determine the price to be paid or received, but because of the difficulty of appraisal much crystal is traded in lots at an overall price. FIG. 12. Quartz boxed for boat shipment to U. S. Graded by weight class and quality. Rio de Janeiro. Price per pound paid for crystal in the United States varies depending on the weight of the stone, and the percentage usability as indicated by the grading scheme. As an indication of the wide range of price it is sufficient to note that quartz from the government stockpile is sold at prices varying from $2.25 to $46.20 per pound. Quartz crystal production is almost entirely confined to Brazil. The price structure, the classification terminology and the methods of classification are all derived from Brazilian experience. Commercial practices are related to geologic features of the quartz crystal deposits. 1. The deposits lie in four elongated belts, widely separated and roughly parallel to one another. 2. Most of the deposits in bedrock are in Paleozoic sedimentary rocks which are not highly folded. 3. Most of the area in which the deposits occur is characterized by deep weathering. 4. Most of the deposits in bedrock are quartz veins, or flat-lying blanket deposits of milky quartz roughly parallel to the enclosing sediments, or a combination of these two types. The clear crystal usually occurs in vugs or pockets and appears to have formed later than the bulk of the milky quartz. 5. The deposits are characterized by very few minerals in important quantity other than milky quartz. 6. Veins are apparently unrelated to other mineralization. 7. The veins are exploited for no product other than quartz crystal. 8. With few exceptions single deposits produce not more than 500 pounds of usable crystal per month. Information available indicates that quartz deposits in bedrock throughout the world, except those in Australia, conform to most of the characteristics listed above. They depart from the Brazilian type in the nature of the surrounding rocks and the extent of the weathering. The Australian deposits differ in many respects. The recurring habit noted in some localities in Brazil and in Australia of the crystal occurring in subsidiary veinlets or branching pods, offshoots from the main body, is perhaps worthy of note. In summary, most of the characteristics listed as typical of the Brazilian province appear from present data to be generally applicable to quartz crystal deposits. * Long Branch Signal Laboratory, Signal Corps Ground Signal Agency, Bradley Beach, N. J.
! Foreign Economic Administration, Washington, D. C.
# Foreign Economic Administration, Rio de Janeiro, Brazil. 1 Foreign Commerce Weekly, 15, No, 6, p. 28 (1944). 2 Minerals Yearbook, Review of 1940, U. S. Bureau of Mines, p. 1422 (1941). 3 Van Wagenen, H. R., Unpublished FEA Reports (1943). 4 Schmidt, W., Houck, J. G., and Irving, Earl M., Unpublished FEA Reports (1943 and 1944). 5 Burns, W., Singewald, Quentin D., and Leland, G. R., Unpublished FEA Reports (1943 and 1944). 6 Miser, Hugh D., Quartz veins in the Ouachita Mountains of Arkansas and Oklahoma: Econ. Geol., 38, 91-118 (1943). Engel A. E. J, and others, Geological investigations of U. S. quartz crystal deposits with special reference to those of Arkansas: Presented at A.A.A.S. Section E Meeting Sept. 1944. Quartz crystal deposits of western Arkansas: Dept. of Interior Information Service, Nov. 9, 1943 (announces availability of maps of the main quartz-bearing areas and individual deposits). The Rough Diamond Crystal Mine and the Calaveras Crystal Mine, Calaveras Co., Calif.: Dept. of Interior Information Service, Sept, 4, 1943. 7 Johnson Fred E., Unpublished FEA Report (1943). 8 Kerr, P. F. and Erichsen, A. L, Origin of the Quartz Deposit at Fazenda Pacu, Brazil: Am. Mineral., 25, 487-499 (1940). Bibliography of earlier papers on quartz crystal in Brazil is included. 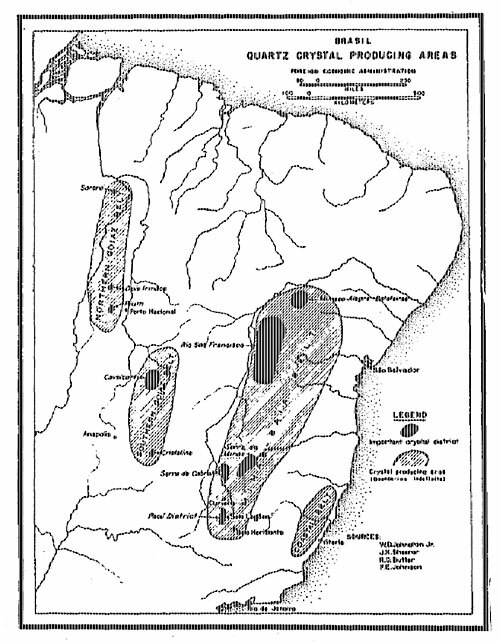 9 Shearer, H. K., Crystal Producing Areas of Northern Goiaz and Southeastern ParÃ¡: Unpublished FEA Report (1943). 10 Johnston, W. D., Jr., Crystal de Rocha em Cristalina, Estado de Goiaz: Div. fomento produÃ§Ã£o mineral (Brazil), Avulso No. 57 (1944). 11 Hanson, F. D., Unpublished FEA Report, 1943. 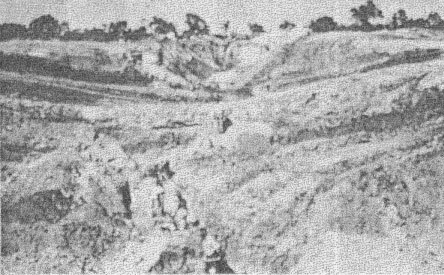 11a According to W. D. Johnston Jr., who has recently carried out detailed studies in some of the quartz districts, certain deposits classed as blanket type furnish indications that filling of open spaces by quartz could have been more important than replacement in the formation of the deposit. 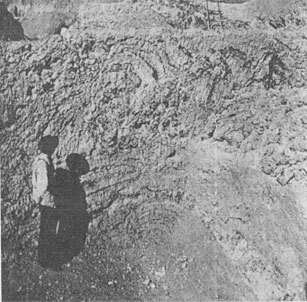 F. D. Hanson and W. D. Johnston Jr. have in preparation a paper describing the details of the deposit at Mimoso. 12 Knouse, F. L., Cristal de Rocha no Estado do Espirito Santo: Div. fomento produÃ§Ã£o mineral (Brazil), Avulso No. 55 (1944). 13 Knouse, F. L., Unpublished FEA Report, 1944. 14 Smythe, D. de C., Unpublished FEA Report, 1943. 15 Knouse, F. L., Cristal de Rocha no Estado do Espirito Santo: Div. fomento produÃ§Ã£o mineral (Brazil), Avulso No. 55 (1944). 16 Shearer, H. K., Crystal Producing Areas of Northern Goiaz and Southeastern Baia, Brazil: Unpublished FEA Report, 1943.